I’m not sure I agree with this graph, but those were some heady days back in 2000. From my humble perch, I’d say web globalization is alive and well. Perhaps searches are going down because more and more people already know what it is — at least that’s how I choose to see it. It’s nifty, though I’m not sure I would use it more than once. And what the heck is Walmart doing there? Walmart failed in Germany and Korea and is still bleeding cash in Japan — not exactly what I would call a web globalization success story. 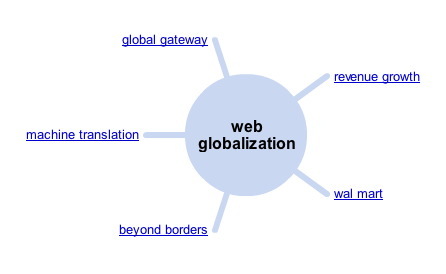 Walmart finished in the bottom 10 of The Web Globalization Report Card. In other Google news, I added Friend Connect to this site — up on the upper right corner. Apparently Google now offers real-time translation of comments, so I’m hoping to give it a spin. UPDATE: I just removed it. It was really slow in loading. Instead I inserted my Twitter feed. I just noticed that the Chinese characters that were supported just fine in Twitter didn’t make it across into my feed as Unicode. This is interesting because I have WordPress setup for Unicode. I’ll have to do some digging. Maybe I should have titled this post The Rise and Fall of WordPress Plugins. How many Fortune 500 companies blog?